Courtesy of Century 21 Toma Partners. Escape to Prescott in this beautiful 4 bed 3 bath home. Nestled in the boulders and pines, yet close to downtown Prescott. Feeling like you’re tucked away in the Pines, enjoy your expansive composite deck while watching deer walk by. 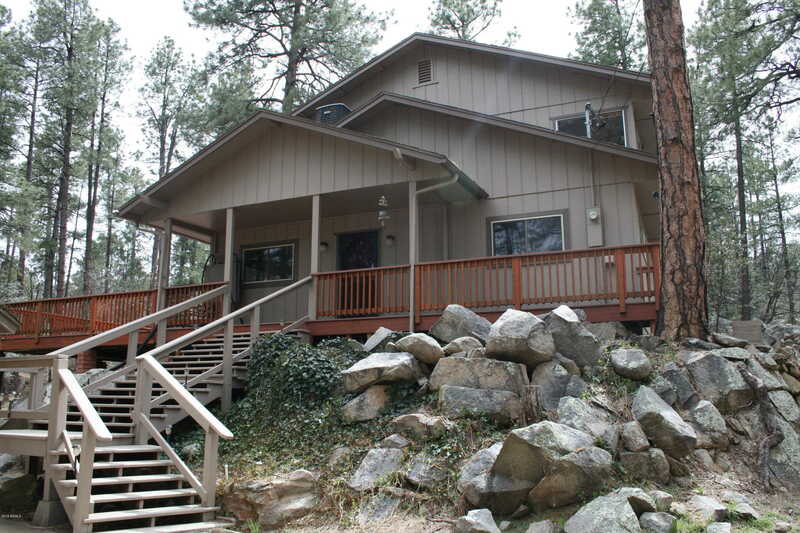 Backed to the Prescott National Forest with a 10 minute walk to Goldwater Lake. Short drive to Prescott Town Square and shopping. Open living space, eat-in kitchen with a beautiful view of the forest. Propane fireplace in family room, with one bedroom and bathroom on the first floor. Three bedrooms and two bathrooms on the second floor, you’ll have plenty of room for family and guests. Spacious living includes large wrap around deck, inside/outside living at its best. The 1.5 car garage has plenty of room for your toys! Schedule a showing today! Approximate size: 16117.00 sq. ft. Please, send me more information on this property: MLS# 5911792 – $429,000 – 3371 S Pinehurst Drive, Prescott, AZ 86303. I would like to schedule a showing appointment for this property: MLS# 5911792 – $429,000 – 3371 S Pinehurst Drive, Prescott, AZ 86303.